Western blot with a variety of human cell lines confirms that the antibody is specific for Mad2. Our Abpromise guarantee covers the use of ab10691 in the following tested applications. WB Use a concentration of 2 µg/ml. Detects a band of approximately 25 kDa (predicted molecular weight: 24.6 kDa). IP Use a concentration of 5 µg/ml. Component of the spindle-assembly checkpoint that prevents the onset of anaphase until all chromosomes are properly aligned at the metaphase plate. Required for the execution of the mitotic checkpoint which monitors the process of kinetochore-spindle attachment and inhibits the activity of the anaphase promoting complex by sequestering CDC20 until all chromosomes are aligned at the metaphase plate. Belongs to the MAD2 family. The protein has two highly different native conformations, an inactive open conformation that cannot bind CDC20 and that predominates in cytosolic monomers, and an active closed conformation. The protein in the closed conformation preferentially dimerizes with another molecule in the open conformation, but can also form a dimer with a molecule in the closed conformation. Formation of a heterotetrameric core complex containing two molecules of MAD1L1 and of MAD2L1 in the closed conformation promotes binding of another molecule of MAD2L1 in the open conformation and the conversion of the open to the closed form, and thereby promotes interaction with CDC20. Phosphorylated on multiple serine residues. The level of phosphorylation varies during the cell cycle and is highest during mitosis. Phosphorylation abolishes interaction with MAD1L1 and reduces interaction with CDC20. Nucleus. Chromosome > centromere > kinetochore. Cytoplasm. Recruited by MAD1L1 to unattached kinetochores (Probable). Recruited to the nuclear pore complex by TPR during interphase. Recruited to kinetochores in late prometaphase after BUB1, CENPF, BUB1B and CENPE. Kinetochore association requires the presence of NEK2. Kinetochore association is repressed by UBD. Western blot using ab10691 at 1/500. 20µg of lysate per lane. Western blot using ab10691 at 1/500. Lane 1: Hela Nuclear Lane 2: Hela Lane 3: A431 Lane 4: Jurkat Lane 5: 293 Mad2L1 predicted size: 24.6kD. Secondary ab: anti-mouse HRP (ab6728) (1/5000) Exposure time: 1min 20µg of lysate per lane. 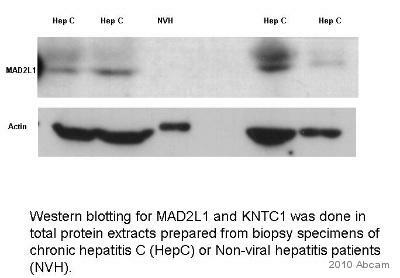 Mad2L1 antibody (ab10691) at 1/1000 (in TBS for 90 minutes at 22°C) + whole tissue lysate of Human liver biopsy (chronic hepatitis C - (HepC) or non-viral (NVH)) patients at 50µg. Secondary Antibody: An HRP-conjugated Goat anti-mouse polyclonal (1/100000). Publishing research using ab10691? Please let us know so that we can cite the reference in this datasheet. What is the epitope recognized by this antibody? The epitope recognized by this antibody has not been mapped.